True Story: on my way to the doctor's office today to get my PET results, I saw THE biggest dog I have ever seen. At first, out of the corner of my eye, I thought it was a pony and did a double take at people walking a horse down a Sacramento street. Eyes wide, I realized that pony was a dog: a huge dog, a monster dog. This dog could the winner of the biggest dog in the world contest. Its shoulders were nearly as high as the shoulders of its owner. It was not one of those long-legged Great Danes, it was thick, husky as well as tall, with one of those faces that has the sagging lips, like a Mastiff. You just know his owners have drool rags all over their furniture. He was brindle colored, but it was clear that he wasn't pure mastiff either. His ears were floppy and his feet were huge. Perhaps he was a combination between a Mastiff, Great Dane, and Shaquille O'Neal. It was really something to see a dog of that size. I stopped my car in the middle of the street and thought about you, my wonderful blog readers, who would have loved to see that gargantuan dog. I rooted around in my purse to try to grab my phone and snap a photo, but alas, there was too much junk for me to grab it quick enough. (Why can't I ever remember to put my phone in the little pocket designed for it?) The dog was turning in a direction the people walking it didn't want to go. They were half-heartedly tugging but they knew they had no choice but to follow the animal's lead, so instantly, they had their backs to me, leaving me with a view of a tail the size of a Python, whipping around happily. As I watched the massive dog move off to sniff something down the street, somebody behind me honked. Options gone, I left the colossal canine without taking his picture and drove into the hospital parking lot for my news. The results of the PET scan were exactly as I expected. There has been "significant increase in size and activity" of the tumor in the liver since the last scan. It is now the size of a golf ball, and the SUV (for you cancer nerds) has increased from 3.9 to 9.7. Speaking of big PETs. There is also bilateral dependent atelectasis of the lungs (lung collapse) which is preventing them from evaluating whether cancer has moved there. However, no cancer was ever seen previously and many things can cause atelectasis, including not taking deep breaths due to pain, and unchanging positions (perhaps due to laziness - you only need one position to post to facebook), so I am not worried about that part. I also have diverticulitis, which explains some of the mid-section symptoms not covered by cancer. I really need to get out and take some walks, I think. My brain, as they always say, is "grossly unremarkable." Why they have to rub that in after every single scan, I don't know. Isn't the fact that I have a growing cancer bad enough without a reminder about how boring my brain is? Really, radiologists, try to think on the bright side. May I suggest the wording, "superior brain untouched by metastatic disease" instead? Sometimes, we need all the good news we can get. So, next week I start my 7th chemo: Gemzar. I may also get to do Perjeta, although it is only approved for use in combination with docetaxol, (taxotere) which I've already had. So, my doctor is going to see if we can convince my insurance to approve it for use with Gemzar. I think it's time I add another HER2 agent as clearly, herceptin is not working as intended. Or, maybe it is and without it I'd already be gone. I know one thing - I don't want to find out. Right now, keeping this cancer under control seems like a mastiff, er, I mean, massive task. 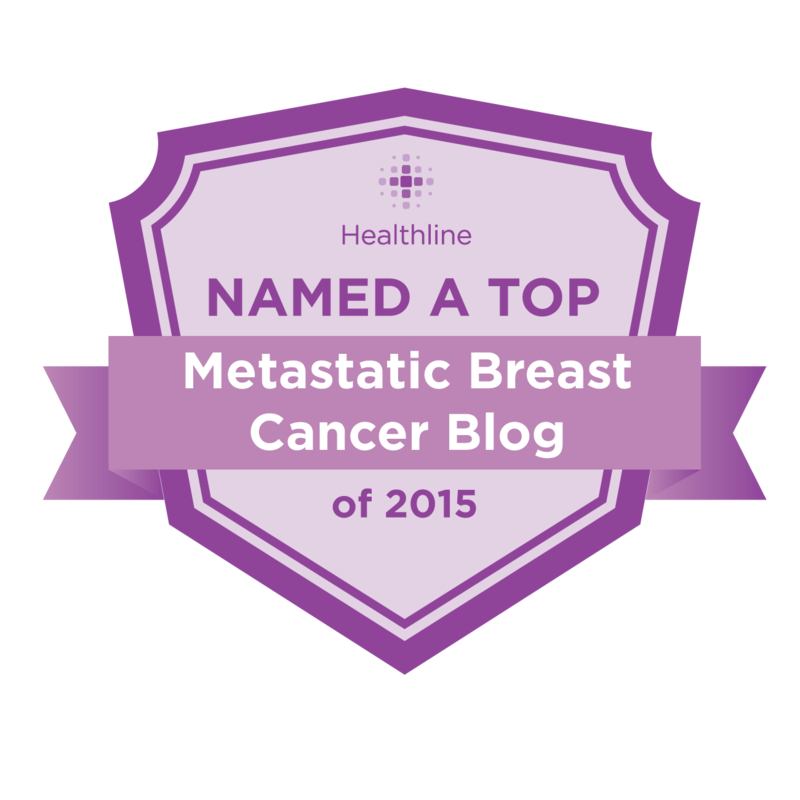 Don't forget to vote for me in Healthline's Best Blog contest. The prize is $1000.00 and you can vote once a day. I am ahead but am not safe by any means, the competition is fierce! Should I win, the money will go into my son's college fund. Don't forget to like me on facebook. If you have not yet, please watch SoulPancake's video and see my wonderful family - and me. Leave a comment on YouTube for the SoulPancake crew (Rainn Wilson and Oprah Winfrey are the bosses) letting them know you admire this uplifting use of the internet - and lack of cats. Ann, I am sorry that your suspicions have been confirmed. Here's to a combination that will push this cr*p out the door. But, no matter what, I still wonder what kind of dog this was - Italian Mastiff? It could have been. It did look more like Mastiff than Dane but it was bigger than most Mastiffs I've seen. Honestly, I love dogs and I love big dogs, and I've NEVER seen anything like this one. I wish I could have gotten a photo. You can bet that I will be looking for that dog from now on! Ann dissapointed to hear the news. I think you do indeed have a remarkable brain. Very sorry to read that your cancer is growing. I hope your doctor is successful in finding a combination that works for you. I'm sorry to hear of your progression - how about tykerb? I hate when you have "suspicions" - because you're usually right! I hope there's some kind of chemo that will stop this (or at least slow it down). Chin up and hang in there; I'm hoping and praying for you. P.S. You gotta get a pic of that dog! I'm intrigued! Your spirit comes through despite the news. Be strong! Your brain is phenomenal bringing "funny" out of such difficulty as cancer! I am keeping you in my prayers, Ann. 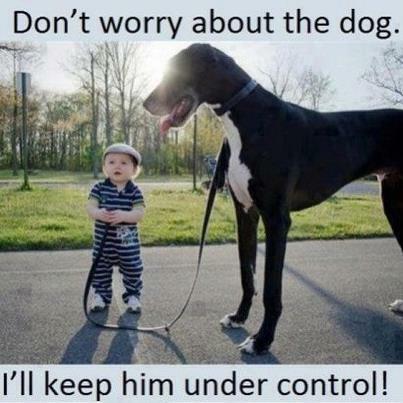 When you go for that next walk imagine that you are walking that big dog but your dog listens to you obediently! He walks where YOU SAY! Then unclip his lead, pat him on the head and tell him, "It's O.K. for you to go now!" and let him RUN OFF! BE GONE! I lol'd at the "remarkable brain" comment. I was given the same comment a number of years ago after an MRI. I told the neurologist that my brain was quite remarkable thanks very much. No question yours is too - you are delightfully witty. I hope that the new medication puts the smack on your tumor. I'm amazed at how many women are living with stage 4 BC for much longer now so sending positive thoughts and wishes your way. That dog. Now imagine walking a creature like that. You'd have to bring along a Hefty kitchen garbage bag to use for a poo bag. A dog that size would leave a big ****. And a big ****! is what I said when I read the results of your PET scan. Luckily your brain is remarkable enough that you will most surely keep a positive outlook. You are an inspiration, and I love reading your blog! Thank you! I don't know you at all, personally anyway, but I think your brain is very remarkable!! I'm sorry about the cancer growth....too bad blogger doesn't have a "dislike" button for that! Hang in there though...you aren't alone and once they figure out the right combo of meds....the cancer will vacate the building! "research and grants". Then select scholarships from the menuon the left side. This blog program dosen't allow cut and paste or upi would have given you the complete link. I dare not try to type it, I would make a mistake for sure. Take care, enjoy the day.